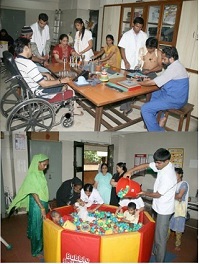 The Physiotherapy department serves patients referred from OPD and Inpatients of the Institute. A Therapeutic program is planned for both- inpatients and outpatients after a thorough Physical Evaluation carried out in the following sections as per the nature of intervention required. Patients are advised physiotherapy modalities from Physical Medicine and Rehabilitation OPD In the section a detailed Physiotherapy Evaluation including subjective and objective assessment is done. The Physiotherapy programme is tailor made to the patients needs. It includes patient education,ergonomic advice, physical agents and specific exercises. Adults with Neuromotor conditions such as Stroke, Traumatic brain damage, Spinal cord injuries, progressive Neuro-Muscular disorders, etc. are assessed and need based goal setting is done in multidisciplinary clinics headed by Physical Medicine and Rehabilitation specialist.Customized physiotherapeutic interventions are selected and implemented keeping in mind the set goals. Post operative therapeutic programme aiming at restoration of function is supported by specialized assessment and training.Therapy to long term in-patients is given in the exercise hall attached to the wards. Observational assessment of gait of persons with disabilities and biomechanics of gait and movement function with or without appliances are analysed specially with respect to choice of suitable appliance and its usage. Therapeutic exercises are used prior to training for improvement of gait and movement function.